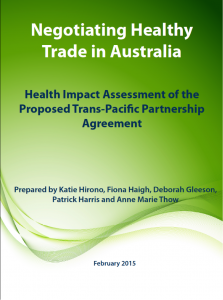 CHETRE has been working with a group of Australian academics and non-government organisations interested in the health of the Australian population to carry out a health impact assessment (HIA) on the Trans Pacific Partnership Agreement negotiations. In the absence of official publicly available drafts of the trade agreement, the health impact assessment drew on leaked texts of potential provisions and formulated policy scenarios based on high priority health policies that could be affected by the TPP. The HIA found the potential for negative impacts in each of the four areas under investigation: the cost of medicines; tobacco control policies; alcohol control policies; and food labeling. In each of these areas, the HIA report traces the relevant proposed provisions through to their likely effects on the policy scenarios onto the likely impact on the health of Australians, focusing particularly on vulnerable groups in the Australian community. The report makes a number of recommendations to DFAT regarding the TPP provisions and to the Australian Government regarding the TPP negotiating process.